Wear your brain on your sleeve, err, chest! 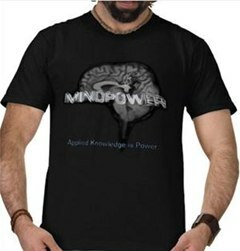 Let the world know you are creative and full of ideas by wearing our custom MindPower T-Shirt. Boldly displays the "MindPower" Brain logo with the slogan "Applied Knowledge is Power." on the front, and the MindPower URL https://youtube.com/mindpower009 across the back.